More than four million Spaniards came to the Western Hemisphere between the mid-nineteenth century and the Great Depression. Unlike that of most other Europeans, their major destination was Argentina, not the United States. Studies of these immigrants—mostly laborers and peasants—have been scarce in comparison with studies of other groups of smaller size and lesser influence. Presenting original research within a broad comparative framework, Jose C. Moya fills a considerable gap in our knowledge of immigration to Argentina, one of the world's primary "settler" societies. Moya moves deftly between micro- and macro-analysis to illuminate the immigration phenomenon. 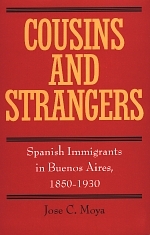 A wealth of primary sources culled from dozens of immigrant associations, national and village archives, and interviews with surviving participants in Argentina and Spain inform his discussion of the origins of Spanish immigration, residence patterns, community formation, labor, and cultural cognitive aspects of the immigration process. In addition, he provides valuable material on other immigrant groups in Argentina and gives a balanced critique of major issues in migration studies. Jose C. Moya is Associate Professor of History at the University of California, Los Angeles. "Moya commands not only the statistical sources but the literary and folklorical ones as well, weaving them in a history that is both analytical and narrative...A superb book that will be a standard monument, not only for Spanish migration and Argentine history, but for migration history in general." "A major achievement, it represents a vast, comprehensive research effort on two continents, using a world-wide background literature and a stunning array of research techniques, all well integrated, on a topic of large scope and significance. The entire enterprise is watched over by an acute, curious, lively mind in notable equilibrium and equanimity, bringing the research to life, fereting out the implications of widely scattered and apparently disparate facts, and reaching many new, significant, and well founded conclusions." "By far the most original on its subject, this book will become a landmark study in Latin American history." "The scope and depth of Moya's research are impressive...His imaginative use of sources and evidence and lively, frequently entertaining prose make this a stimulating, satisfying, and ascinating study...This is scholarship that is meticulous, well-reasoned, and highly original." "One of the truly first-rate studies in the vast migration literature--an authentic tour-de-force."